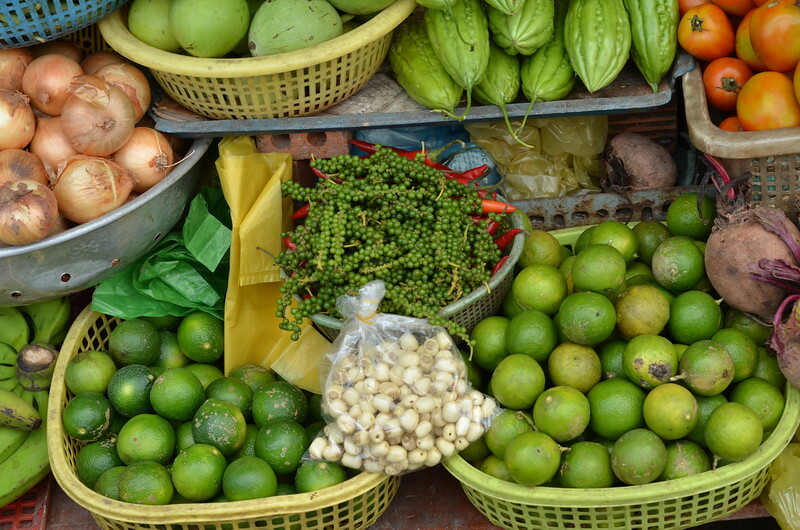 Mekong is a land with all beauty in endless fertile rice fields, shades of coconut roads, vast fruit orchards, magnificent handicraft villages, unique floating markets and amazing friendliness of local people. It is great to have a more close-up and a slow moving to feel more the Mekong Discovery. This Mekong Discovery six days makes a full look that if you do any further, it is a kind of repetition or just pushing pedals on the less attractive roads. The experience is from nature (big rivers, maze of canals, vast rice farm, fish farms, etc) to people (visiting villages along the routes, meeting people on ferries and at stops, boat drivers, ) and special feature of culture (floating market, boat culture, worshiping Local Goddess, etc). On bike you have everything on your pace, at small roads, little bridges, remote hamlets, and authentic Mekong. The language is limited meanwhile the experience of this trip is worth of more than a book. Road type: absolutely flat, semi-paved, paved, soil roads. The Mekong Discovery biking is at easy level of adventure as roads are flat, not many traffics and many opportunities to cycle under the tree shade. The only challenge is that there are days biking at backroads and you will have to bike over some bridges (1m x 5m) without handrails. There are some days with biking upto 80km, other just 30km; however, the flat roads will make the distance a small challenge. Watch our rules of road traffic in Vietnam to get ease with local style. Along the biking we get many stops to penetrate into local lives, control the group scattering, help the small leg regain the muscle strength, and make sure any support should be done. Accompanying the biking group are a tour guide, a van and a truck (to transport bikes). The bigger groups can be with more than one tour guide, bike repairer, big trucks plus big bus. However, there are some roads is only for bikes, evacuation plan if any will be made by boats or local tuktuk. This tour is designed to bring flexibility for your time in Vietnam that if you have longer stay and wish to see more Vietnam, you can add Central Highland 7 days biking or North Vietnam on bike 7 days, or both. Group size is minimum 2 and maximum 10 travelers. Please inform your height when booking for a suitable bike arrangement. Boating at Cai Be and Cai Rang Floating market. Passing rivers by local fairies. 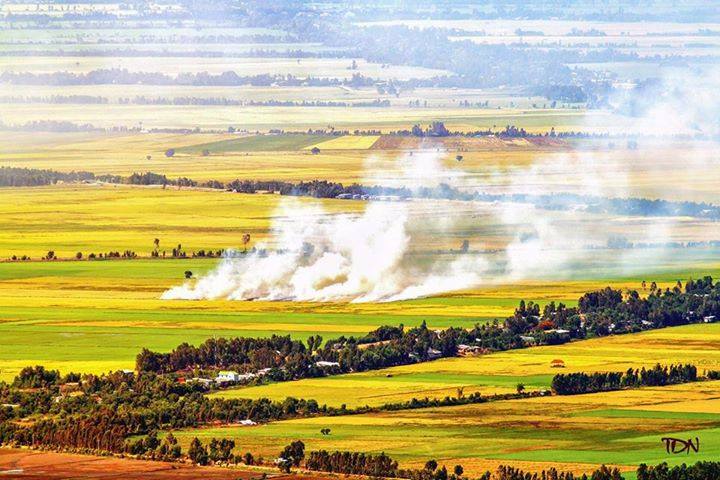 Trails across rice fields, fruit plantations, by schools, poor villages. 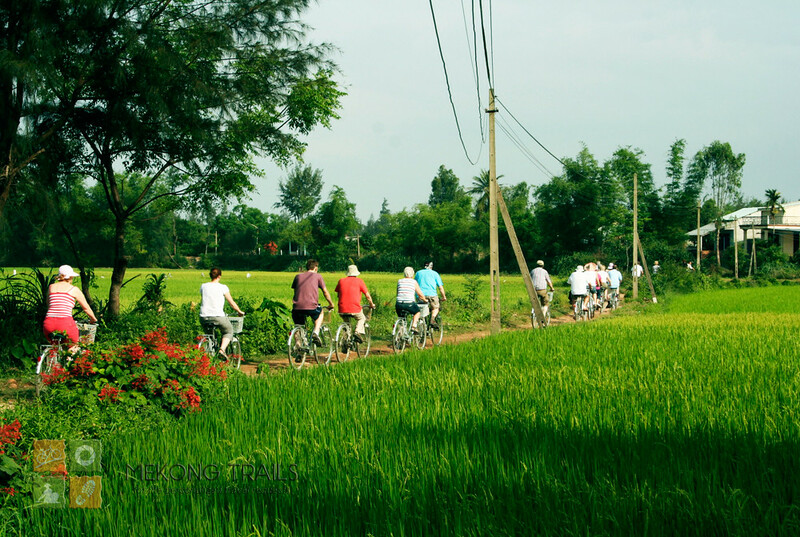 Cycle across a huge rice field. Peace on bike across My Hoa Hung Island in the middle of Mekong River. The challenge of biking to Sam mountain under sunset. Cajeput forest biking and boat trip. Hotel view over a huge rice field 200m under your room window, with sunset and sunrise. Take a lift by bus around 60 minutes to get out of the crowd of 10 millions motorbikes in Saigon. Put on your gear and start to cycle at outskirt of Saigon. Take the small roads passing by villages with poor houses, bike further to Mekong Delta across rice fields, dragon fruit plantations, and rivers. The experience of passing the river with local people on a local ferry should be great with conversation with student girls, old farmers or local merchandisers. After the two fairies, stop en route for a picnic lunch at a fruit orchard. 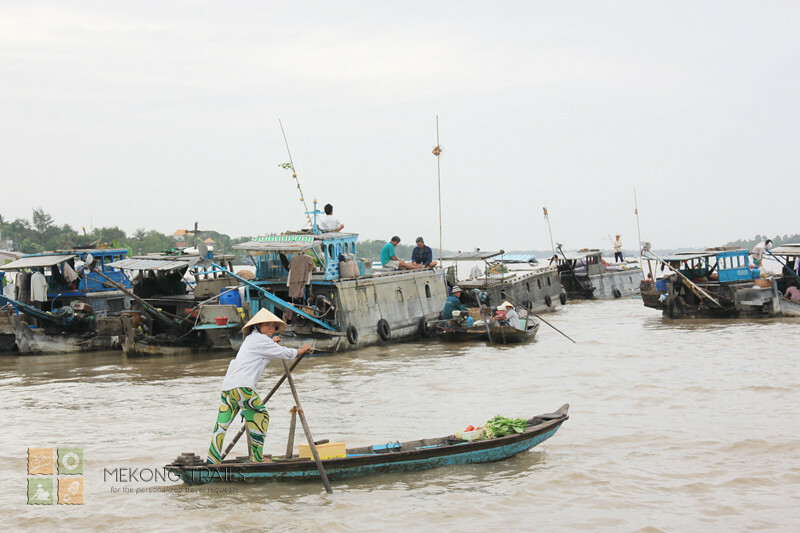 Have breakfast, get on the boat with your bike and cruise to a floating market, a very special feature of Mekong Delta business as trading are made on boats only. Enjoy the beautiful view of hundreds of boats with their agricultural products on those by boating back and forth the market. Take your bike from the boat and start to cycle from a river bank of an island. Biking along small trails, get on another local ferry, push the pedal deep into Mekong, to the terracotta kilns, villages, flat rice fields, schools and all other spectacular features of Mekong daily life. Stretch your leg with around further 20km across a huge rice field zone to arrive Bassac river bank. Take a boat from this river bank to your hotel. Enjoy a much bigger floating market before getting on your bike to continue the cool ride along the trails that are often next to a canal. Enjoy the scenery of villages, local businesses, bridges, fruit boats back and forth on the river. Take a local boat which helps people and vehicles to cross the river. After a stop for lunch by the river, make more biking along the Bassac river with view of vegetable farms, fish farms, local villages on stilts over the canals. Stop at some of these to have photo, talk with local people and enjoy more the peace of the land. Take the ferry to get back to the big road for the overnight in a coolest hotel in town of Long Xuyen. Back to your ferry to get off the beaten tracks. Follow the beautiful trails in the My Hoa Hung island (one of the big islands in the Mekong river) to bike further among the fertile scenery of Mekong Delta. Totally flat roads lead you to the villages, markets, orchards, fish farms and daily life of Mekong Delta. Getting across the river by ferry to Cham land for a different view of biking. Champas was a Kingdom locating in the middle of Vietnam and now remained scattered some of provinces. The Cham people in this Mekong follows Islam for some historical reasons. That makes the view much different in houses, people along the road, and their business. Have breakfast, looking over the huge rice field 180m under your breakfast table, among the beautiful sunrise on it. Have a cycling down the hill, get along the man made canals to the cajeput forest which is a biosphere in Mekong delta. Biking along the beautiful trails, have some sampans to make the most peaceful corners of your minds, have lunch with local specialties before biking back to Chau Doc Town to visit the temple of Goddess, Tay An pagoda. Take the last and the biggest challenge for riding uphill to your hotel, or just take a lift to your hotel for the beautiful sunset with a cup of tea after a shower. Cycling uphill can be also a ride that “bikes among sunset view”. Say goodbye to your bike because the next day is without biking. Have a short boat trip on Bassac river, visiting the fish farm houses you have seen on bikes the day before. Get one some of the house to know how Vietnam can make a lot of fishes and make new war with American farmer of cat fish war. Take the bus back to Saigon with lunch en route. End the tour in the afternoon. Mai Thanh Van homestay is a series of attached rooms to the main house where the sisters named Mai, Thanh and Van stay with their parents. Green and clean space with beautiful orchard, cool canal, friendly sisters, great living space. Dong Xuyen is the 3 star with wifi, modern interior decoration, close to bank, clean and standard rooms, friendly staff with English in Vietnamese accent. As the best in town, this hotel is often the wedding place of local couples, as well as the corporate meetings. The 5 star standard with views overlooking the endless rice fields and with long man-made canals, luxurious interior decoration, well trained staff, enjoyable atmosphere, nice swimming pool and a good restaurant with a great view. Our Journey Planner will review your inquiry and respond via email within 24 business hours. 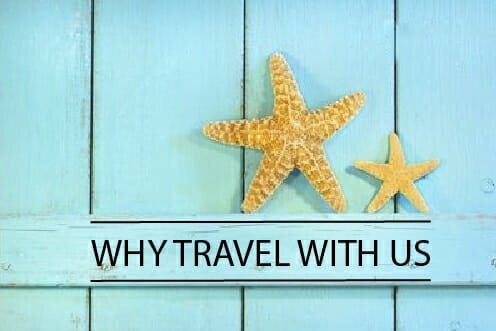 We look forward to being your travel mates.